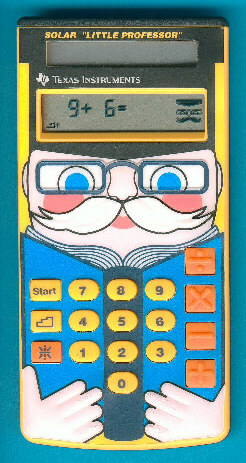 Size: 5.7" x 2.9" x 0.5"
Compared with the early Little Professor with the LED display this one uses like the Little Professor (1985) a LCD to ask the child one of 80,000 pre-programmed math questions but added solar cells. A very similar styling was used on the later products manufactured in China. Compare it here. Don't miss the similar Mickey Math Adventure. This Solar Little Professor is one of the 6 calculators that were awarded with the Blue Angle environmental label. But Texas Instruments never decorated the calculator with the logo.